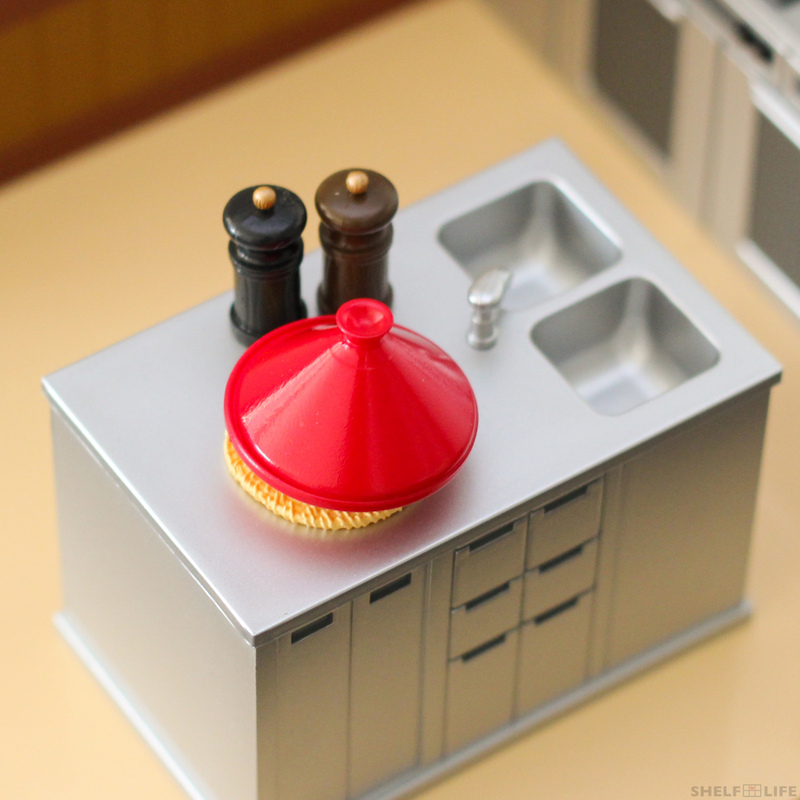 Today, I’ll be reviewing a RE-MENT set for the first time, the Happiness Recipe set. It’s the first non-character themed set in 3 years, so I hope this is just the beginning of more Puchi Sample series miniatures, maybe even some re-releases from the discontinued lines. Anyway, I hope this review will give you an idea about the quality of RE-MENT products in general as well as how they scale with Nendoroids in particular. 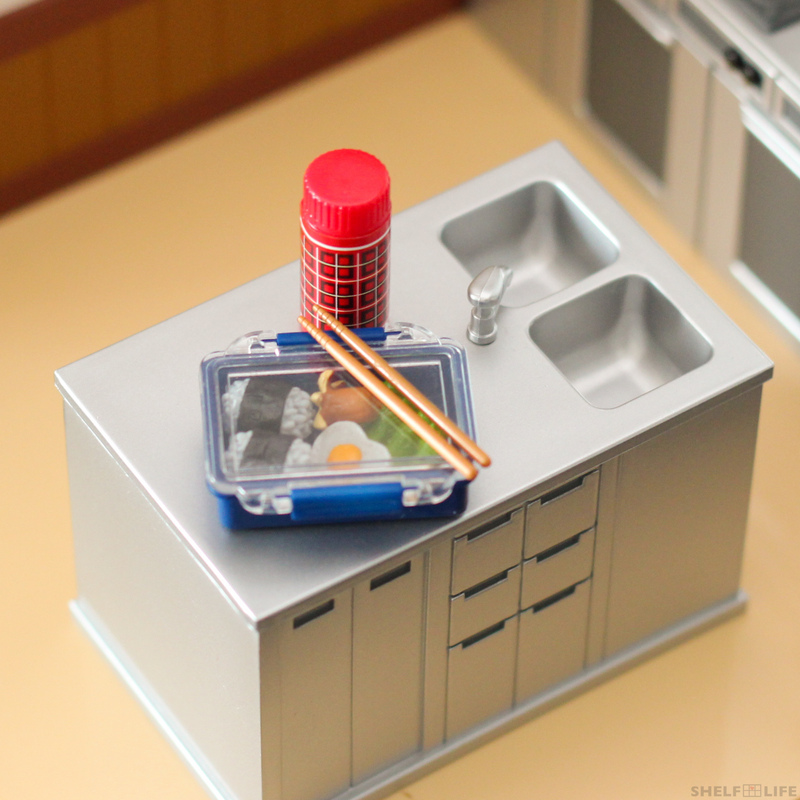 RE-MENT miniatures are usually sold individually as blind boxes, but I have a whole box here. 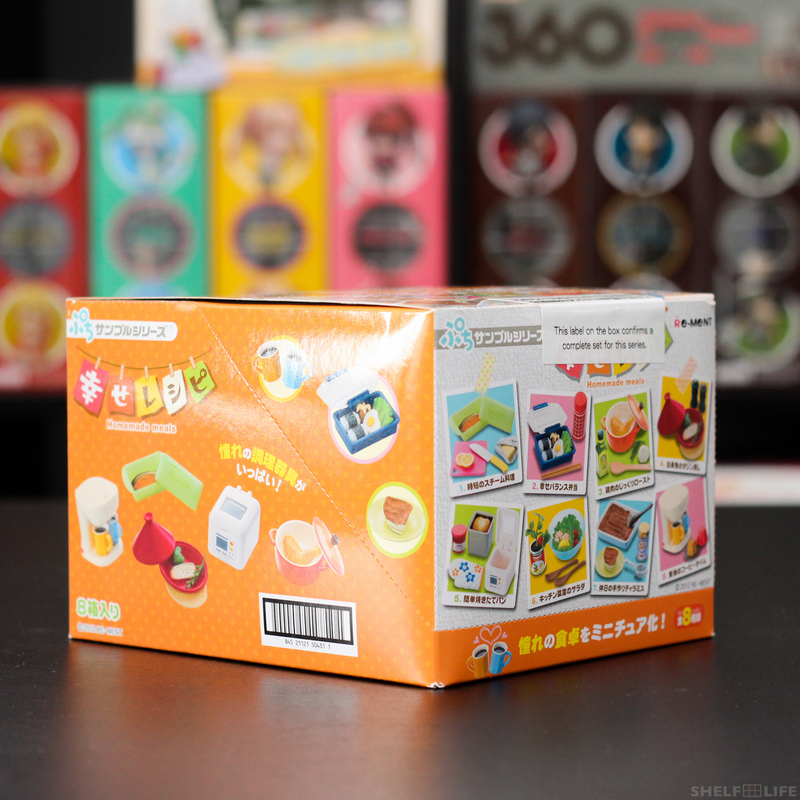 There are 8 different sets to collect in a box, and one box will come with an entire set. Contains: a green container with lid, a piece of salmon, a stick of butter, slices of lemon, a purple cutting board, and a knife. 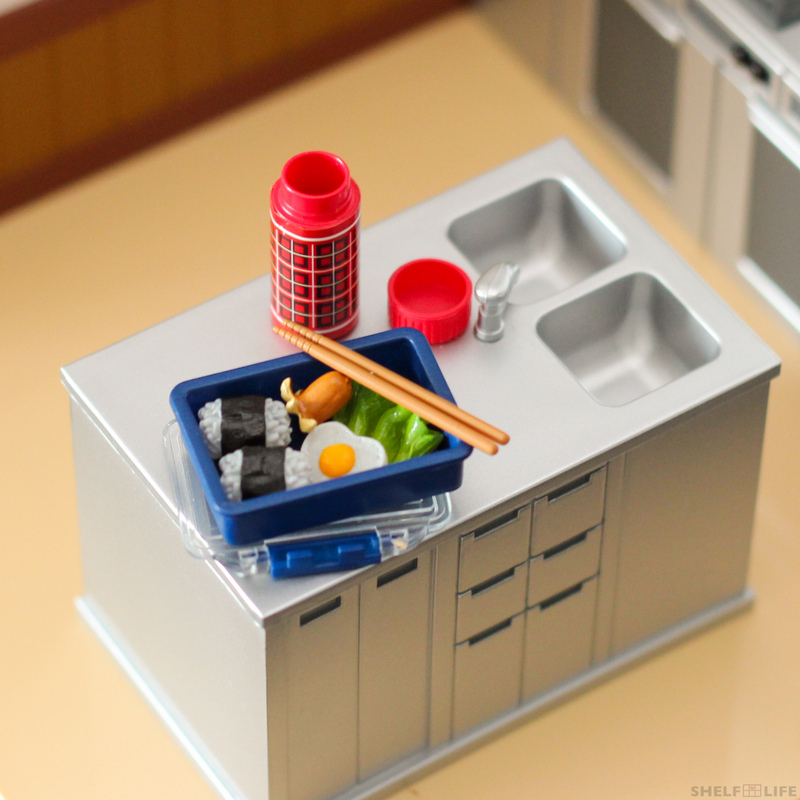 Contains: a blue lunch box with attachable lid, two rice balls, an octopus sausage, a fried egg, lettuce, chopsticks, and a thermos with lid. 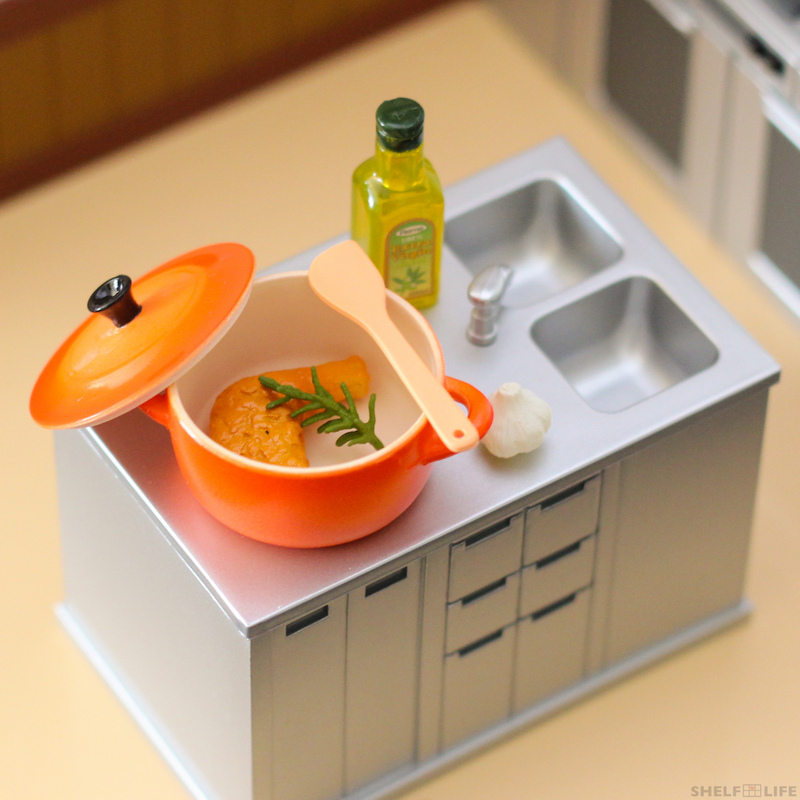 Contains: an orange pot with lid, a chicken drumstick, herbs, garlic, spatula, and olive oil. 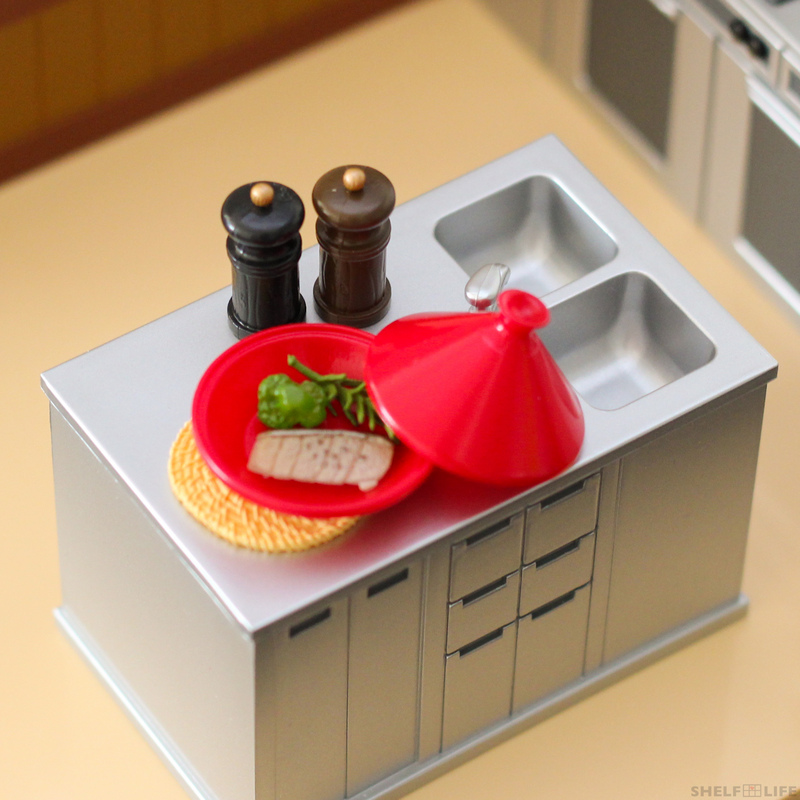 Contains: a red container with lid, a trivet, a piece of fish, herbs, broccoli, and salt and pepper mills. Contains: a breadmaker, inner pan, a loaf of bread, an oven mitt, and a jar of jam. 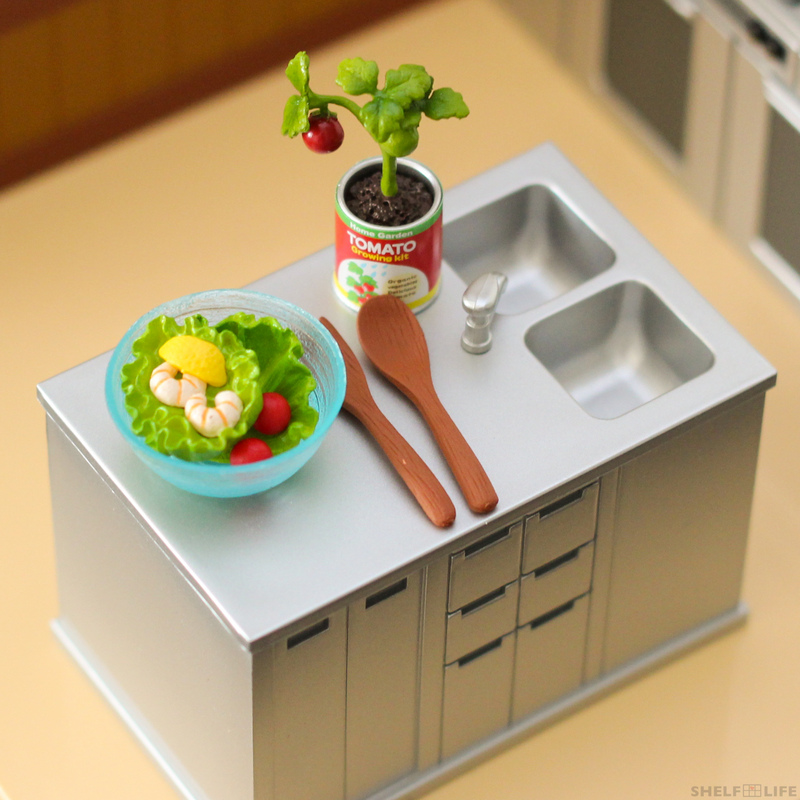 Contains: a salad bowl, a large piece of lettuce, a smaller piece of lettuce with shrimp and lemon attached, two tomatoes, a can, a vine in soil with tomatoes attached, and salad tossers. Contains: a blue dish, tiramisu with missing corner, a piece of tiramisu, a yellow plate, a container of cocoa powder, a spoon, and a sieve. 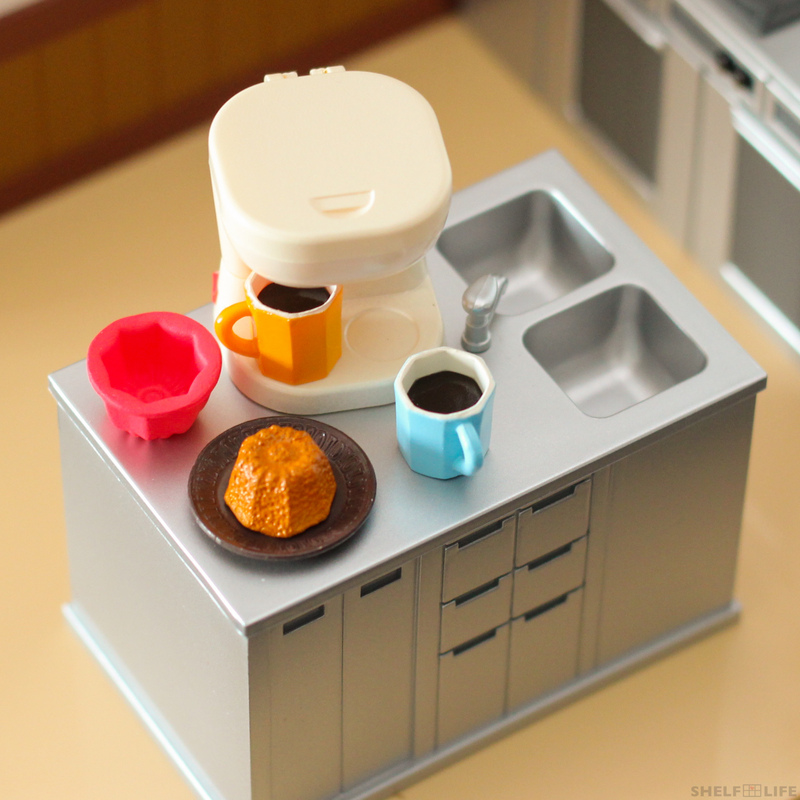 Contains: a coffee maker, two mugs with removable coffee, a brown plate, a piece of cake, and a cake mould. 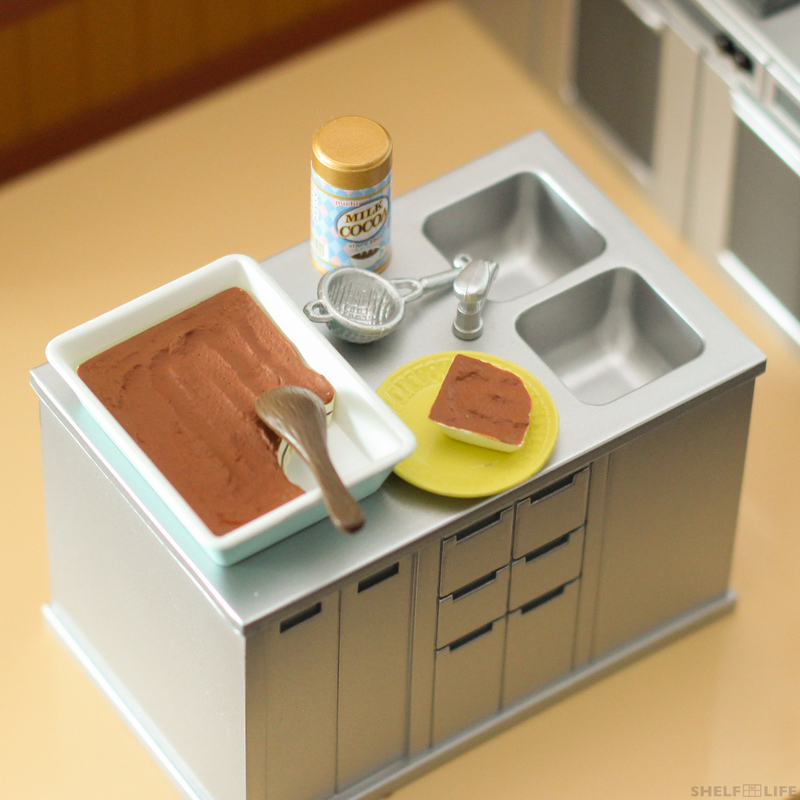 As you can see, RE-MENT miniatures are very detailed. 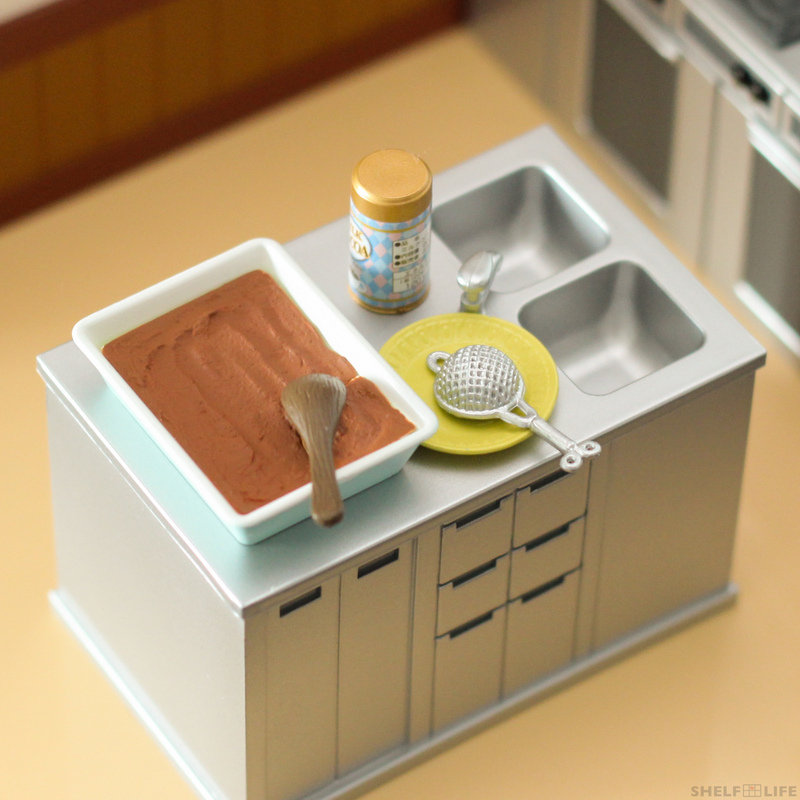 Even at this size, you can see the details in both the sculpt and texture of each miniature as well as the paint job, not to mention all the pieces like the pots and lids, the tiramisu, and the coffee, piece together perfectly. The lunch box lid even clips into place. However, if you compare this set to the older RE-MENT sets, you’ll actually find that the overall quality has decreased. 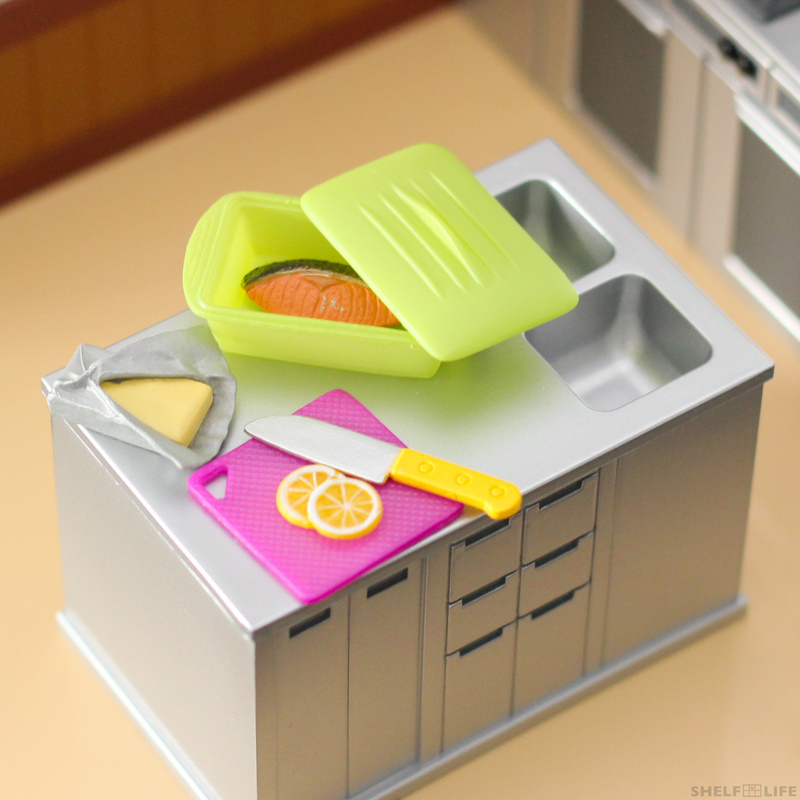 One noticeable problem I found with my set was the piece of salmon in my steamed foods set. Some paint for the salmon skin got onto the salmon itself, so I was a bit disappointed by that as well. 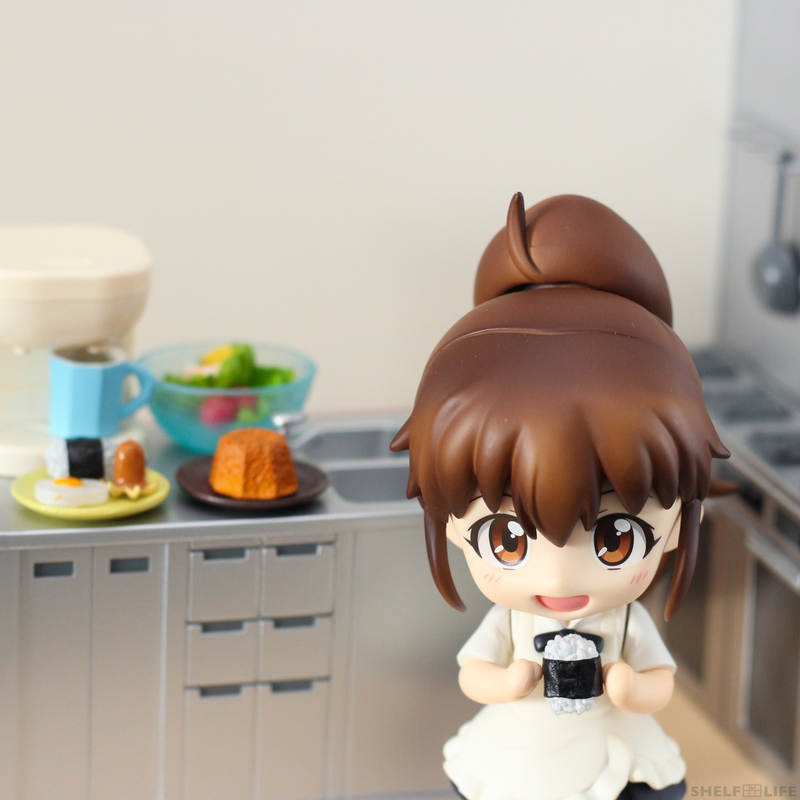 In all the pictures above, I used my Wagnaria Kitchen Nendoroid playset as the background, and you can already see that most things are too big if you compare them to the sink on the right. 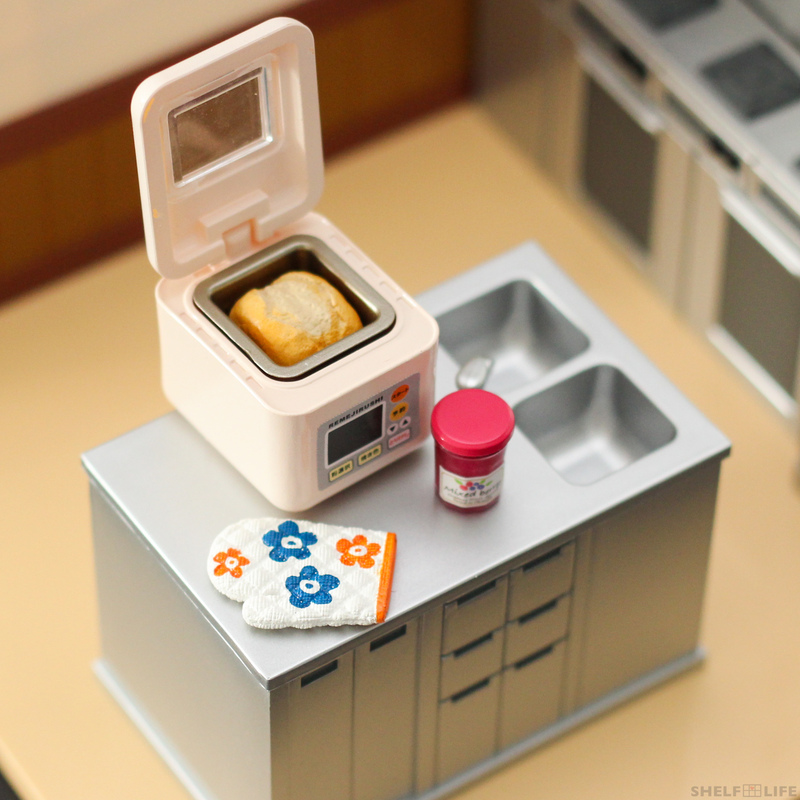 Let’s stick Popura-chan in there and… some things definitely are much too big (´д｀) – utensils, the oven mitt, and the containers, in particular. Some other things, even though they’re still big, seem to work alright though thanks to the chibi nature of Nendoroids. 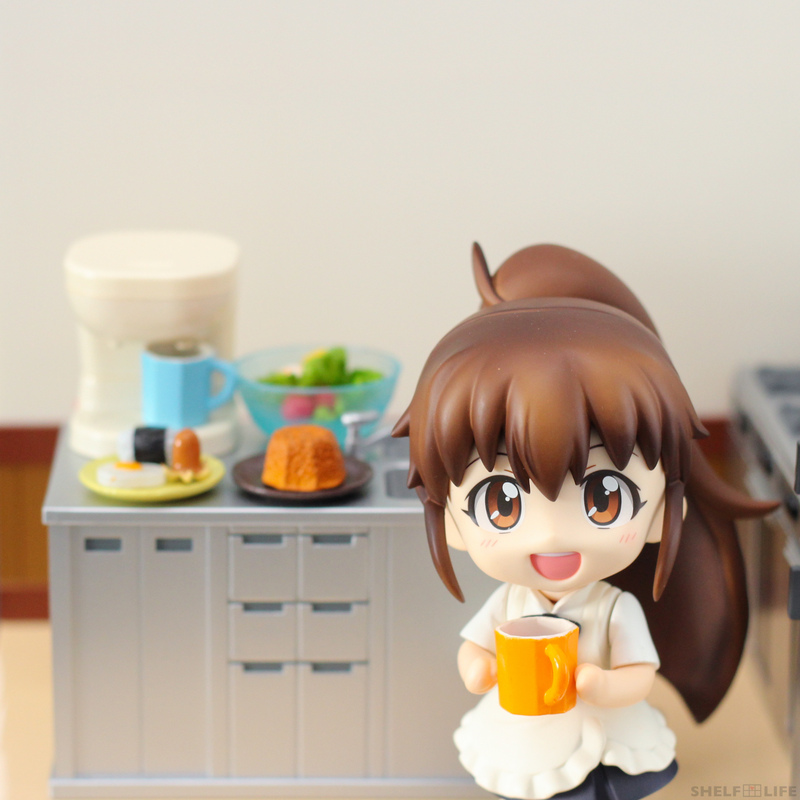 Here’s Popura-chan holding one of the mugs. Of course, if you use them in the background, everything will look just fine! Then there are other things that work almost perfectly. 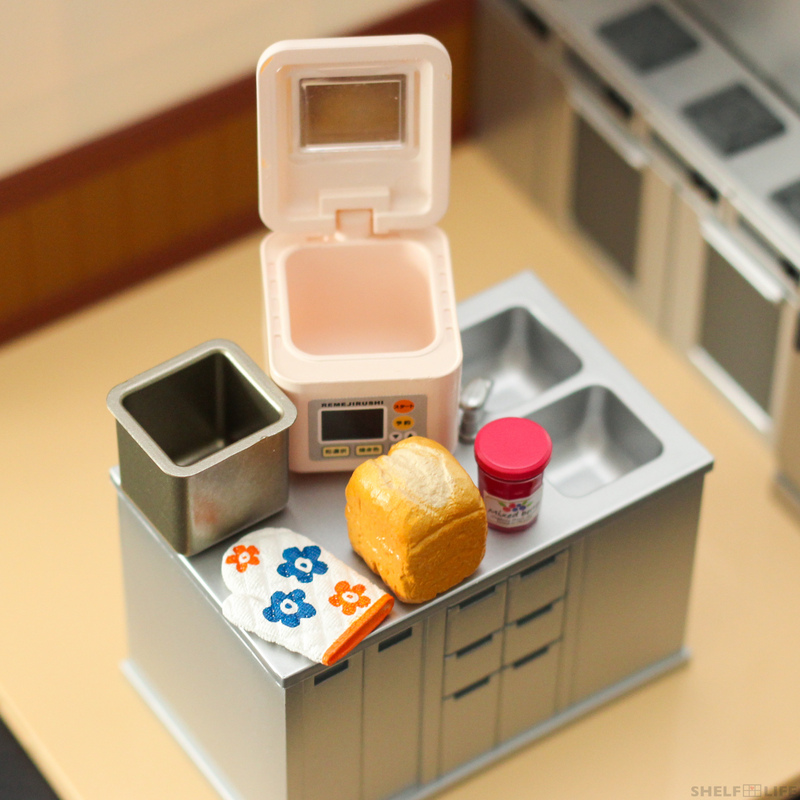 The food accessories in particular, scale quite well. 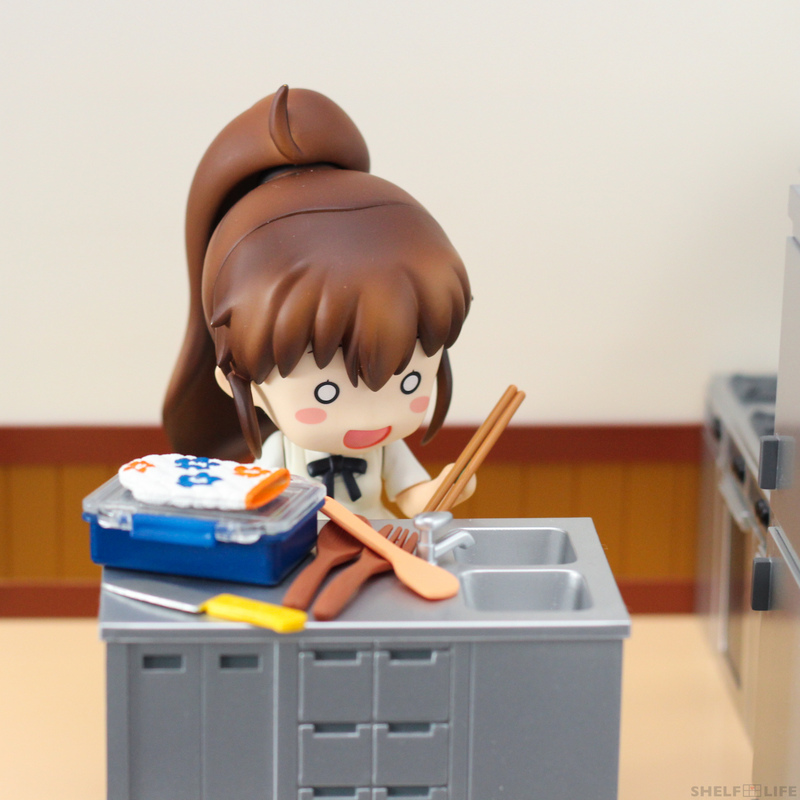 This is Popura-chan with one of the rice balls from the lunch box set. 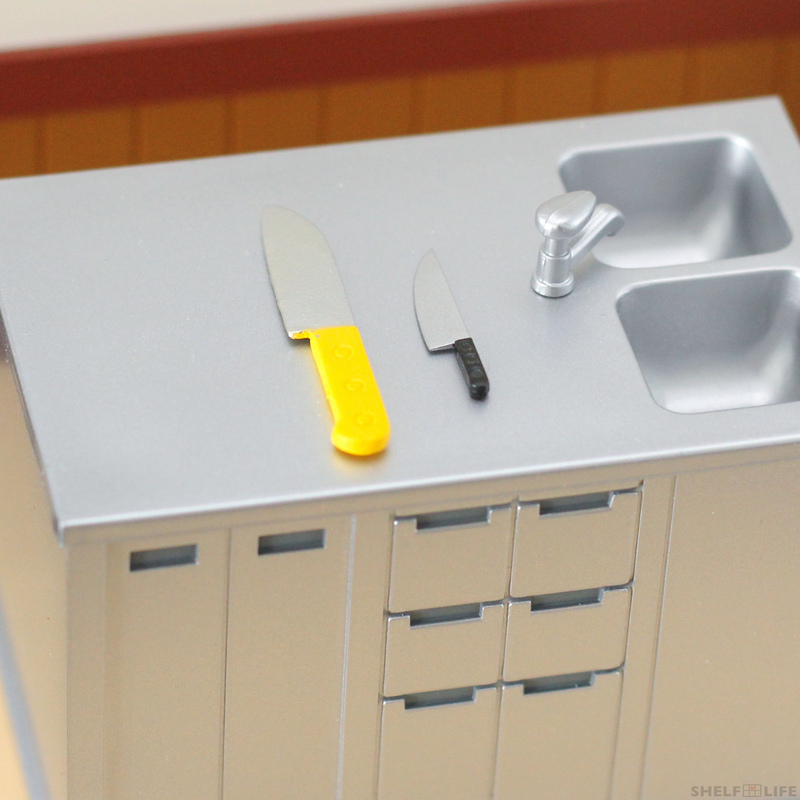 To give you an even better idea of their size, here are comparisons between the knife and the cutting board from the steamed foods set and the knife and the cutting board that came with the playset. 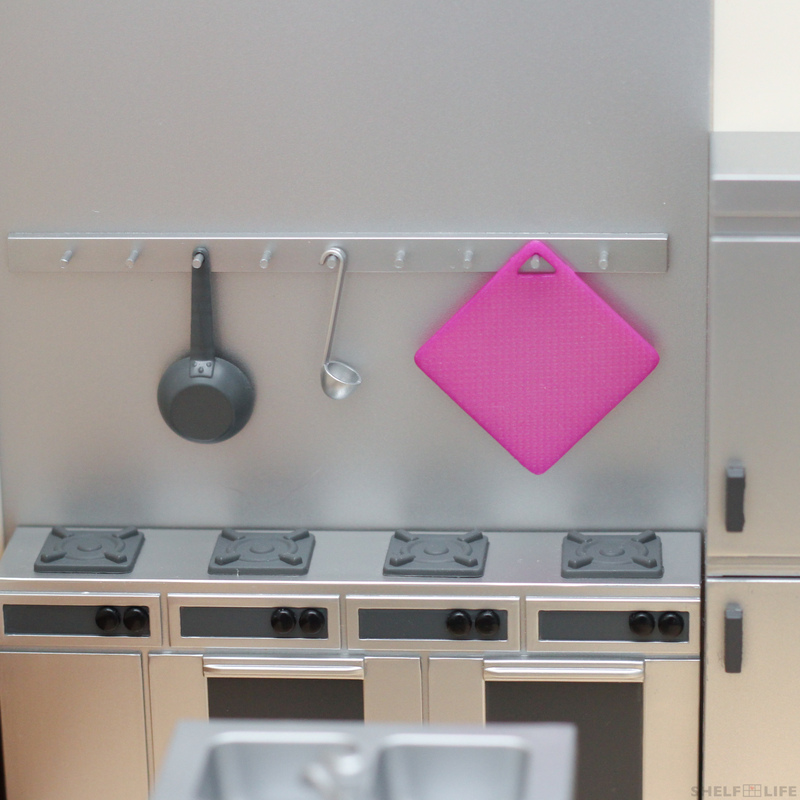 The cutting board actually doesn’t look too bad. 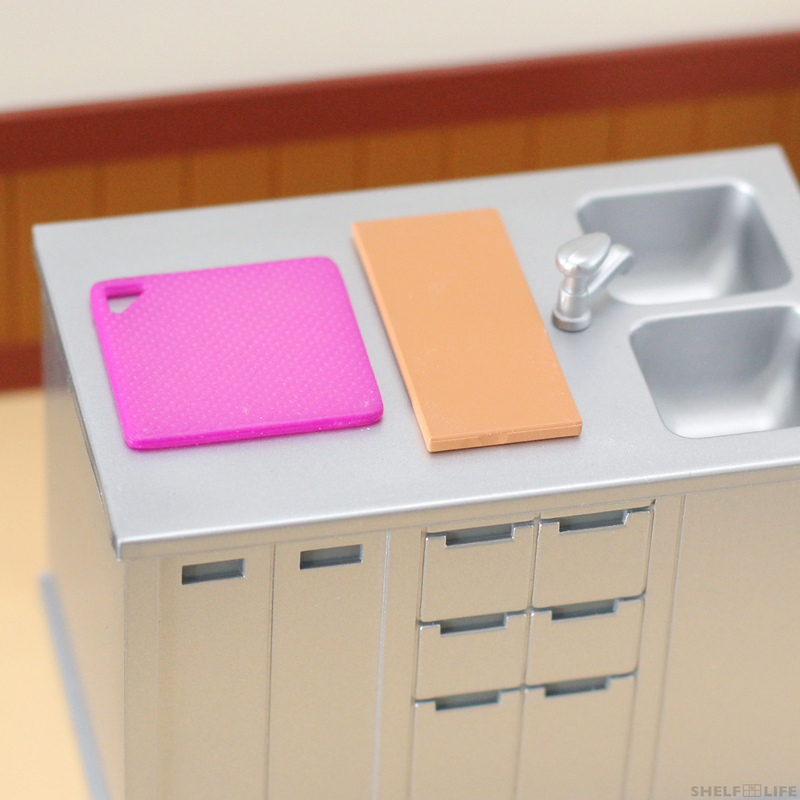 Maybe it can be an extremely large cutting board – those exist, right? I actually really like the hole they added in the corner. It allows me to hang it up in the kitchen like this! 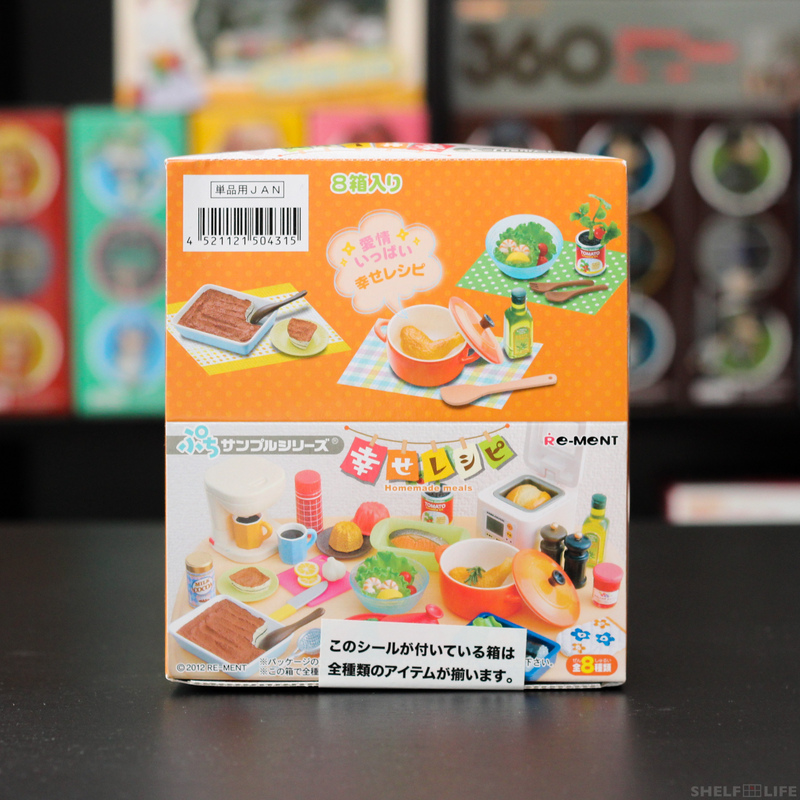 Anyway, my overall thoughts on the set – It’s a nice, colourful set with a lot of different food themes and a homemade feel. I still love the detail and the quality, even if they aren’t as good as they used to be, but it’s unfortunate that most pieces are a bit too big to use with my Nendoroids, at least, directly. 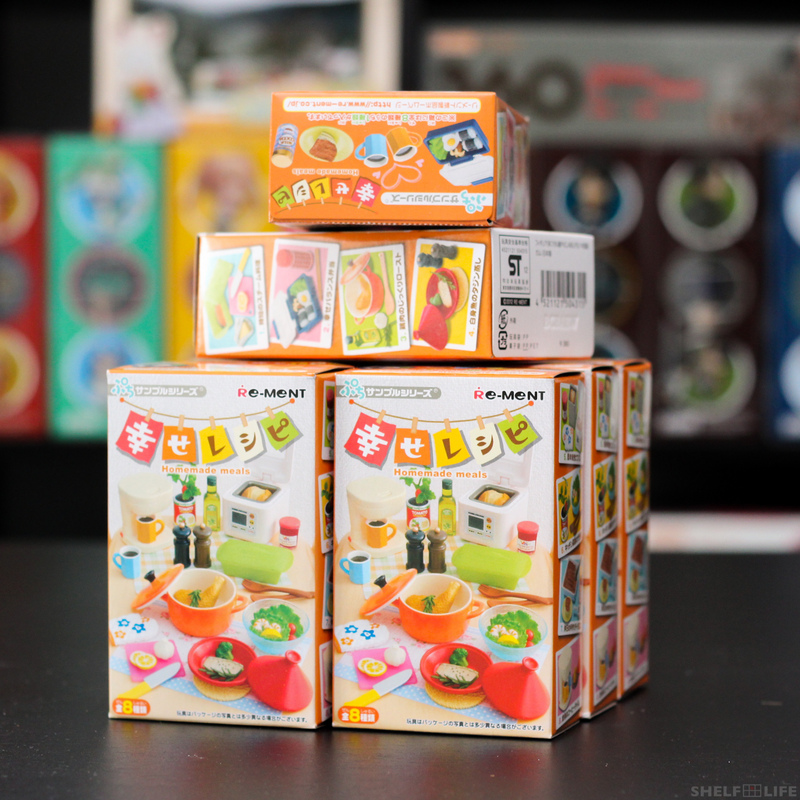 Most of the food do scale fine, and the other accessories will still look great in the background, especially with their fun colours. 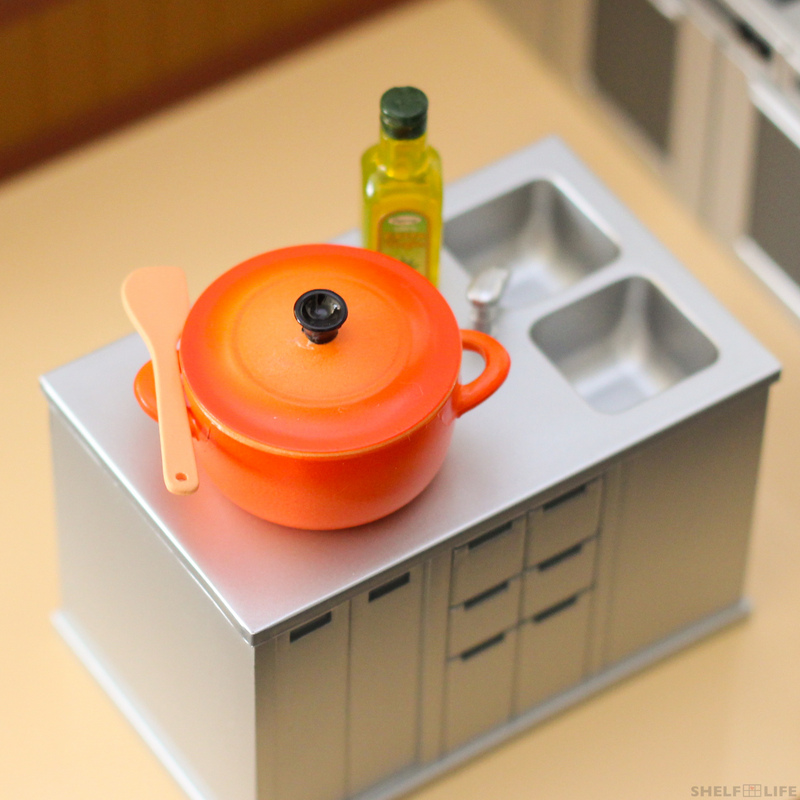 They will definitely fill up any empty-looking kitchen or diorama. Food is a universal language after all, so I know I’ll definitely be able to re-use these many times regardless. That’s it for today’s review. I hope you enjoyed the pictures and the review. If you have any comments or suggestions or other things you’d like to see in my future reviews, please feel free to leave a comment! ^ᴗ^)/ Until next time~ Mata ne! Posted in Miniature Reviews, Miniatures, RE-MENT, ReviewsTagged miniatures, nendoroid, re-ment, reviewBookmark the permalink.